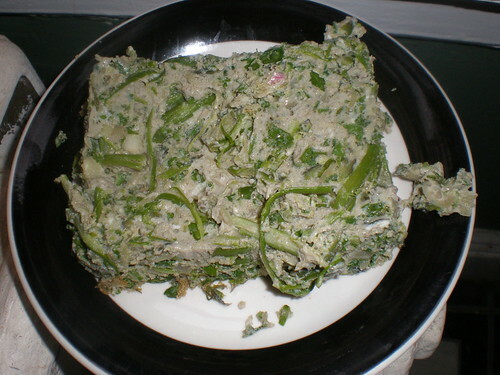 Asparagus pie is made like this… Put in the mortar asparagus tips… crush pepper, lovage, green coriander, savory, and onions; crush, dilute with wine, broth, and oil. Put this on a well-greased pan, and, if you like, add while on the fire some beaten eggs to thicken in, cook… and sprinkle with very fine pepper. Regular readers may be wondering why I haven’t posted about cooking from Apicius for a long time. The truth is that this most recent attempt, which was a few months ago, was such an unmitigated disaster that I couldn’t bring myself to write about it until some time had passed. I suppose it was bound to happen, but it was still almost a shock after my previous successfulattempts. 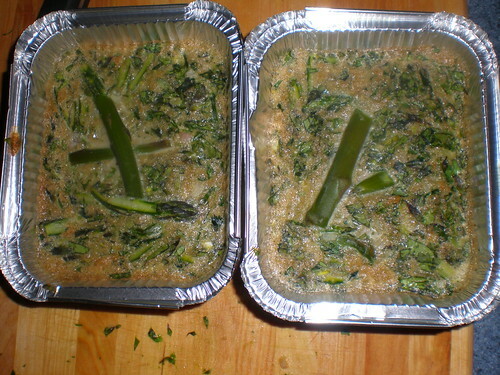 My edition of Apicius notes that “the asparagus should be cooked before crushing,” so to prepare the asparagus I cut off the ends of them and blanched them in salted water until they were tender. Then I cooled them in an ice bath before mixing wit the other ingredients. I chopped savory, lovage, and cilantro (green coriander), and added them to a bowl with the mashed drained asparagus. I added some olive oil, some salt and pepper, and some beaten eggs. Reluctantly I added a splash of wine, as the recipe called for. I say reluctantly because I couldn’t see how the wine would work with these ingredients, and I say splash because I added as little as I could. I wanted to stay true to the recipe, but the smell coming from the bowl as I mixed everything together was a little… disconcerting. I ended up with enough mix to fill two aluminum baking tins, which I had oiled up. For a little extra presentation I placed some cooked asparagus tips on top. I put the baking tins into a bigger pan, and filled that part of the way up with hot water, the same way I have cooked other custards, and placed the whole thing into a 350 degree oven. I let it cook until the whole mixture firmed up, about 30 minutes. The result looked ok, you can see it in the picture at the top of the page. Unfortunately the sour smell had intensified in the oven. Then I turned them out of the pan, and was horrified to see the result. It looked a little like dog food gone bad. I didn’t want to, but I knew I had to taste it. Yes, I ate that. And yes, it tasted as bad as it looks. The closest thing I can compare it to might be something unfamiliar to most readers. During Passover, my family always serves what they call souffle, usually in several different vegetable flavors — broccoli, cauliflower, etc. They are usually pretty wretched, managing to be both tasteless and mushy. My asparagus custard was much worse, but it had the same texture as those souffles. So I decided to take a little break from cooking Apicius. I don’t know if the fault lies with my interpretation of the recipe, or the difference in tastes between Ancient Rome and present day, or something else entirely. Rest assured, with the bounty of the summer market I will go back to Apicius someday soon.